Picture - Nakajima Ki-27 of the Akeno Army Flying School, ca. winter 1941/42 (see Bueschel 1970). 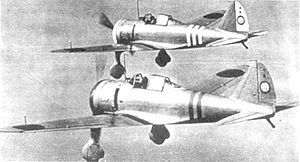 The Nakajima Ki-27 (九七式戦闘機 , Kyūnana-shiki sentōki, or Type 97 Fighter) was the main fighter aircraft used by the Imperial Japanese Army Air Force up until 1940. Its Allied nickname was "Nate", although it was called "Abdul" in the "China Burma India" (CBI) theater by many post war sources; Allied Intelligence had reserved that name for the nonexistent Mitsubishi Navy Type 97 fighter, expected to be the successor to the Type 96 carrier-borne A5M with retractable landing gear and an enclosed cockpit. The results were the Nakajima Ki-27, the Kawasaki Ki-28, and the Mitsubishi Ki-33 (a modification of the Mitsubishi A5M carrier-based fighter). The Nakajima design was based on its earlier Ki-11 monoplane fighter which lost to the Ki-10 in the Type 95 Fighter competition. When the follow-up Nakajima Ki-12 proposal with a liquid-cooled engine and retractable landing gear was deemed too complex by the Japanese officials, the Ki-27 was designed by Koyama Yasushi to have an air-cooled radial engine and fixed landing gear. The aircraft had the Nakajima trademark wing with a straight leading edge and tapered trailing edge which would reappear again on the Ki-43, Ki-44, and Ki-84. The Ki-27 was the Imperial Japanese Army Air Force's main fighter until the start of World War II. When placed into combat service over northern China in March 1938, the Ki-27 enjoyed air superiority until the introduction of the faster Soviet-built Polikarpov I-16 fighters by the Chinese. Picture - A Ki-27 as used in the Battle of Khalkhin Gol. In the 1939 Battle of Khalkhin Gol against the USSR in Mongolia, the Ki-27 faced both Polikarpov I-15 biplane and the I-16 monoplane fighters. In the initial phase of the conflict, its performance was a match for the early I-16 models it faced, and considerably superior to the I-15 biplane. With clearly better trained and experienced Ki-27 pilots, the IJAAF gained aerial superiority. The deficiencies of the Ki-27 included a lack of armor protection for the pilot, absence of self-sealing or fire suppression in the fuel tanks and inadequate armament of two 7.7 mm (.303 in) machine guns. Despite these faults, whenever Ki-27s managed to scatter an enemy formation and engage in dogfights, the Soviets had little chance of escaping unscathed. Later the Soviet Air Force started to receive improved and new types including an improved I-16. The faster, more heavily armed, armored and more robust I-16 proved to be superior to the Ki-27. The new I-16 also allowed Soviet pilots to routinely escape from the Ki-27 in a dive. The VVS started to use new combat tactics consisting of flying in large tightly knit formations, attacking with altitude and/or speed advantage, and hit-and-run (high-energy) tactics. Consequently, as Japanese pilots began to be exhausted by the strain of constant combat, losses soon became heavy, and as a result, in spite of the Ki-27's excellent maneuverability and early performance, the Japanese claim of 1,252 downed enemy aircraft (six times the official Soviet losses number and three times as high as the actual number of committed Soviet aircraft in total) is clearly unrealistic. Top scoring pilot of the incident and top scoring IJAAF pilot on the Ki-27 and overall WW2 IJAAF ace was Warrant Officer Hiromichi Shinohara, who claimed 58 Soviet planes (including a IJAAF record of 11 in one day) whilst flying Ki-27s, only to be shot down himself by a number of I-16s on 27 August 1939. The preference of Japanese fighter pilots of the Ki-27's high rate of turn caused the Army to focus almost exclusively on maneuverability, a decision which came back to haunt them later as it handicapped the development of faster and more heavily-armed fighters. The Ki-27 served until the beginning of World War II in the Pacific, escorting bombers attacking Malaya, Singapore, Netherlands East Indies, Burma and the Philippines (where it initially fared poorly against the Brewster Buffalo). The type also saw extensive action against the American Volunteer Group in the early months of the war. Soon outclassed by the American Curtiss P-40s, the Ki-27 was replaced in front line service by the Nakajima Ki-43, with surviving examples continued to serve as a trainer. The Ki-27 was also exported for use with Manchukuo and Thai armed forces, seeing combat with both. In Thai service, Ki-27s reportedly damaged two P-51 Mustangs and shot down one P-38 Lightning. Near the end of World War II, a few Ki-27s were equipped with up to 500 kg (1,100 lb) of explosives for a kamikaze role. Private-venture experimental aircraft with Nakajima Ha.1a engine. Prototype version with armament in response to IJAAF specs, two aircraft built. Pre-production units with armament and heavier Ha.1b engine, 10 aircraft built. First production version. Approximately 565 aircraft built. Trainer version converted from existing production. Approximately 150 aircraft converted. Improved version with an improved canopy, oil cooler and provision for 4 x� 25 kg (55 lb) bombs or fuel tanks under the wings. A total of 1,492 built, including 50 by Tachikawa Aircraft Company Ltd.
Trainer version converted from existing production. Approximately 225 aircraft converted. Experimental lightened version developed as an interim solution when Ki-43 development was delayed, top speed 475 km/h (295 mph); two aircraft built). Trainer version, built by Manshūkoku Hikōki Seizo KK with a 510 hp Hitachi Ha.13a-I or Ha.13a-III engine. A total of 1,329 aircraft built in four sub-versions (The single seat Ki-79a (Ha.13a-I) and Ki-79c (Ha.13a-III) and the two-seat Ki-79b (Ha.13a-I) and Ki-79d (Ha.13a-III)). In 1945, Indonesian People's Security Force (IPSF) (Indonesian pro-independence guerrillas) captured a small number of aircraft at numerous Japanese air bases, including Bugis Air Base in Malang (repatriated 18 September 1945). Most aircraft were destroyed in military conflicts between the Netherlands and the newly proclaimed-Republic of Indonesia during the Indonesian National Revolution of 1945-1949. One Ki-27 is preserved at the Tachiarai Peace Memorial Museum. One Mansyu Ki-79 is preserved at the Satria Mandala Armed Forces Museum, Jakarta, Indonesia. Data from "Nakajima Ki-27 Nate"
Francillon, Ph.D., Ren� J. Japanese Aircraft of the Pacific War. London: Putnam & Company, 1970 (Second edition 1979). ISBN 0-370-30251-6. Green, William and Gordon Swanborough. "The Agile Asian... Japan's Type 97 Fighter". AirEnthusiast Six March-June 1978. Bromley, Kent, UK: Pilot Press Ltd., 1978. Mikesh, Robert. Japanese Aircraft 1910-1941. Annapolis, MD: Naval Institute Press, 1990. ISBN 1557505632. Thorpe, Donald W. Japanese Army Air Force Camouflage and Markings World War II. Fallbrook, CA: Aero Publishers, Inc.,1968. ISBN 0-8168-6579-5.